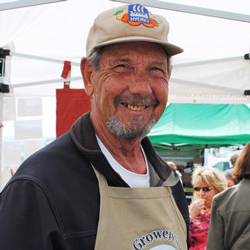 Olsen Organic Farm is eagerly awaited by loyal citrus lovers each November, but you won’t see them at the Ferry Plaza Farmers Market this winter. The beloved farm has no oranges or mandarins to sell. Olsen Organic Farm is located in Lindsay, California, about an hour southeast of Fresno, at the base of the Sierra Nevadas. When Olsen acquired the farm in 1996, he thought he’d made a wise choice buying a hillside property with a warm microclimate well-suited to growing citrus in the winter. But the land had one drawback: no aquifer, meaning no wells. Olsen must rely on an allocation of water from the local irrigation district, an agency tasked with managing and distributing water resources through contracts with the federal government and other districts. He has always been allocated sufficient water, even in dry times. But this year, he received only 10% of his usual water supply. With California facing an extreme drought this year, the Lindsay-Strathmore Irrigation District was one of a number of districts that received an unprecedented 0% of its usual water allocation. As a result, growers are suing state water authorities, claiming that federal water was diverted from their districts to other projects without honoring historic water rights. The district was able to purchase water from neighboring districts to provide a small allocation to their farmers. Scott Edwards, the district’s general manager, says that with so little water, about 20% of the citrus farms in his district are out of production. With a fraction of his usual water supply this year—a combination of district water and water purchased at a high premium from a neighboring farmer with groundwater—Olsen has been irrigating his citrus trees just enough to keep them alive. He estimates that up to a fourth of his trees have died from water stress, though he won’t know for sure until next spring. “I hope and pray that we’re going to have a good water year, so we can be back in business next spring with a new crop,” says Olsen. With savings and other investments to help cover his living expenses and his minimal farming costs this year, he will be able to weather this year’s financial loss, but he worries about what the future holds if predictions of a megadrought hold true. Relying on water from an irrigation district for half of his fields, Massa didn’t know how much of his usual water allocation to expect earlier this year. So he changed up his usual strategy and planted rice only in the fields that had access to groundwater. In his district fields he planted crops that would require little irrigation, such as safflower, oats, and sorghum for seed and pig feed. The Massas’ main plot wound up receiving 75% of the usual allocation, while their other plot, on Greg’s father’s farm 20 miles away in another district, received only 50%. Both are supplied by the Sacramento River, fed from Lake Shasta. With Lake Shasta currently at 23% capacity and no idea how much water the season will bring or how much the irrigation district will allocate, this winter Massa is planting wheat and other crops that can grow strictly on rainfall. Since pigs can survive on those crops and relatively little water, the Massas have shifted their focus to pork sales at markets, not knowing how much rice they’ll be able to plant next year. While the farm does have some groundwater, the Massas need to use what little water they can get from their two irrigation wells to keep their almond trees alive and producing. “Groundwater is dropping like crazy. Shallower wells are going dry,” he says. “There are so many people putting in new wells and they’re getting deeper and bigger all the time.” Drilling a new well costs about $100,000, and the waitlist is at least a year. Olsen Organic Farm is out for the season. 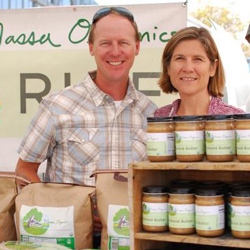 Massa Organics can be found on Saturdays at the Ferry Plaza Farmers Market. Friant-Kern Canal photo by Don Barrett.